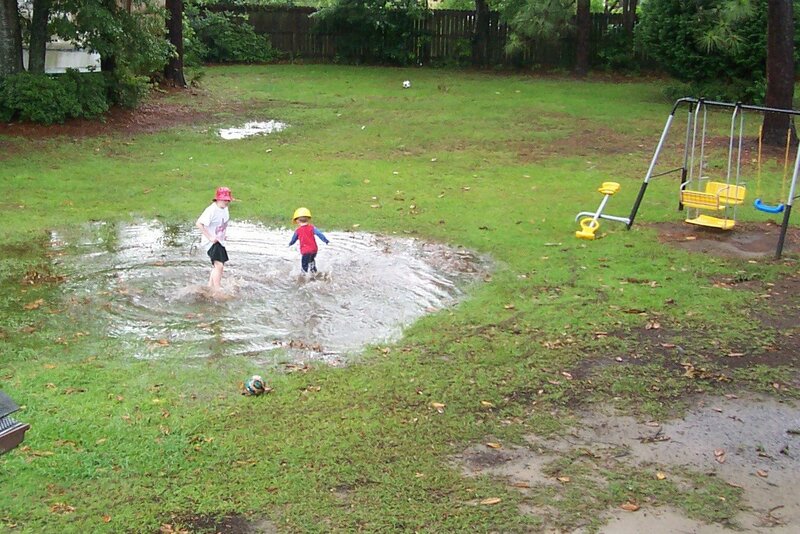 A picture of the boys enjoying a rain puddle in the “sink hole”. They love to splash and get dirty. But, thankfully, they do like to get clean after! This school year passed quickly- today’s the last full day. I’ve been busy with two kids at home while my oldest goes to school. Baby number three was born last September, a month after school started here. That last month of pregnancy I spent running around trying to make sure everything was in order. During that month the soon-to-be middle child, a few months shy of turning three, quit taking naps. I blame myself. It was I who changed up the routine. I hardly slowed down to rest and when I did I crashed in the recliner with the little guy. So, when baby number three came home, there was no downtime during the day. I’m still trying to regain a since of “quiet time”, if not a nap time, with the now three and a half year old. And I’m suffering through the his crankiness in the middle-late afternoons. Over the summer I plan on keeping a schedule, more or less, to help keep us from chaos. The oldest needs lots of tutoring. The middle child needs lots of physical activity. The crawling girl needs constant supervision. And I need a creative outlet. Wish me luck on the balancing act! This entry was posted in kids, summer by Carrie Dalby. Bookmark the permalink.